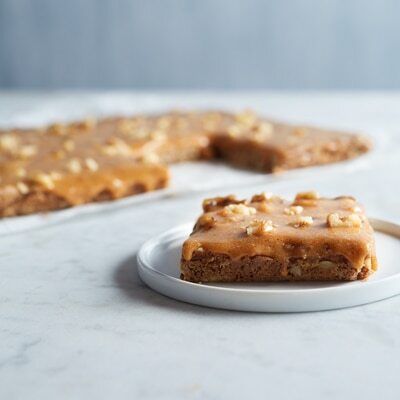 Pumpkin Butterscotch Fudge Bars have a tremendous flavor combination of chopped nuts, miniature marshmallows and butterscotch morsels and make a chewy, moist and flavorful bar. Great for lunchboxes, after school snacks or for dunking into your favorite hot beverage. PREHEAT oven to 350° F. Line 15 x 10-inch jelly-roll pan with foil. COMBINE flour, oats, brown sugar, nuts, coconut, baking soda and pumpkin pie spice in medium bowl; mix well. Stir in butter; mix well. Press into prepared jelly-roll pan. BAKE for 13 to 15 minutes or until slightly brown. Cool in pan on wire rack. COMBINE butter, evaporated milk, sugar, pumpkin, pumpkin pie spice and salt in medium, heavy-duty saucepan. Bring to a boil, stirring constantly, over medium heat. Boil, stirring constantly, for 8 to 10 minutes. Remove from heat. STIR in marshmallows, morsels, 1/2 cup nuts and vanilla extract. Stir vigorously for 1 minute or until marshmallows are melted. Pour over cookie base; sprinkle with remaining nuts. Refrigerate until firm before cutting into bars.